Hi all! 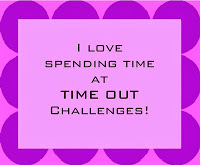 It's time for a new Time Out challenge and this week it's a theme challenge. 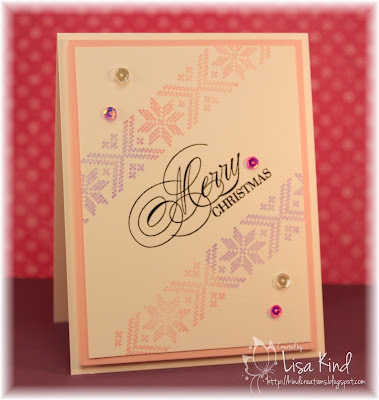 The theme is Christmas and there's a twist: Use pink and/or purple. I used this sketch from CAS(E) this Sketch. I think I missed the deadline! Oh well! 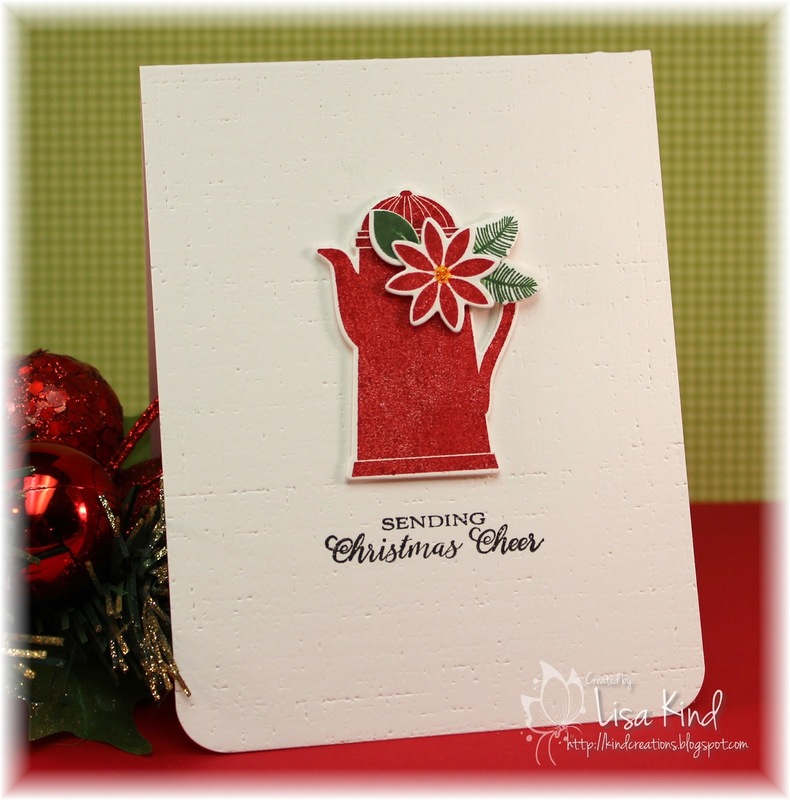 This challenge is sponsored by Uniko Studios and a participant who twists with us will be randomly chosen to win a stamp set from Uniko. Also, we have some of the Uniko DT joining us for this challenge! Welcome girls! You can see more from the Time Out DT and our guest, Suchi, on the Time Out blog. Hi everyone! 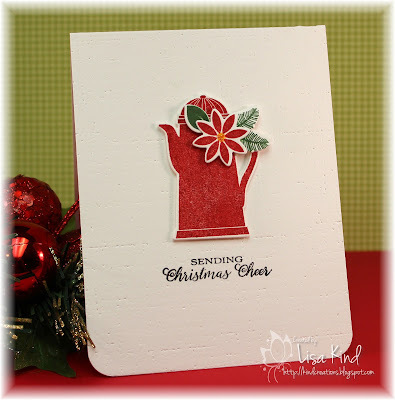 I'm participating in the Papertrey Ink blog hop today. It's a little late in the day, but I really wanted to play along. I got some of the new products and wanted to get them inky. Here's the photo they chose as inspiration. 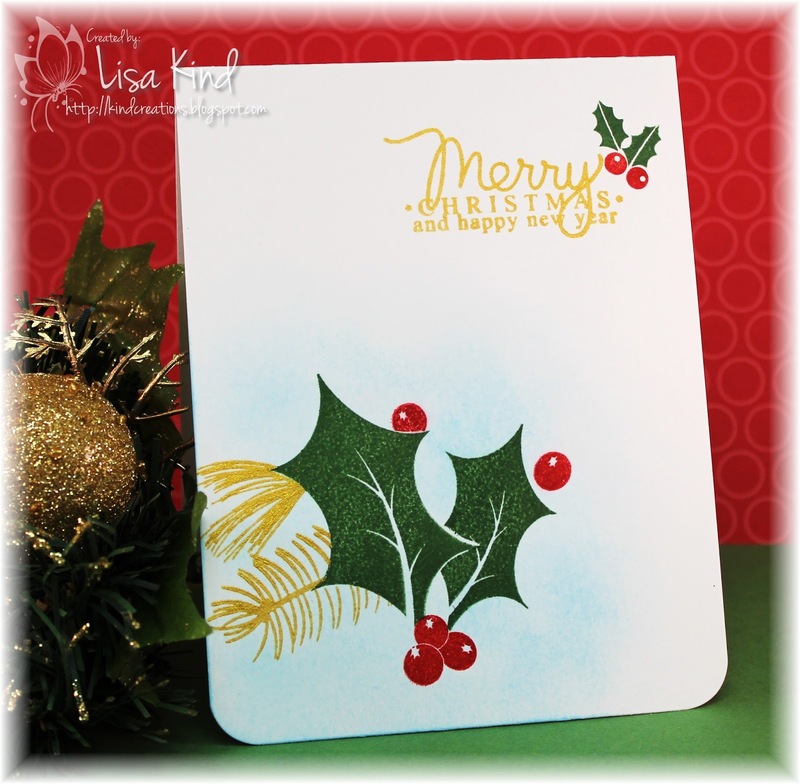 I made this tag using the traditional red and green colors. 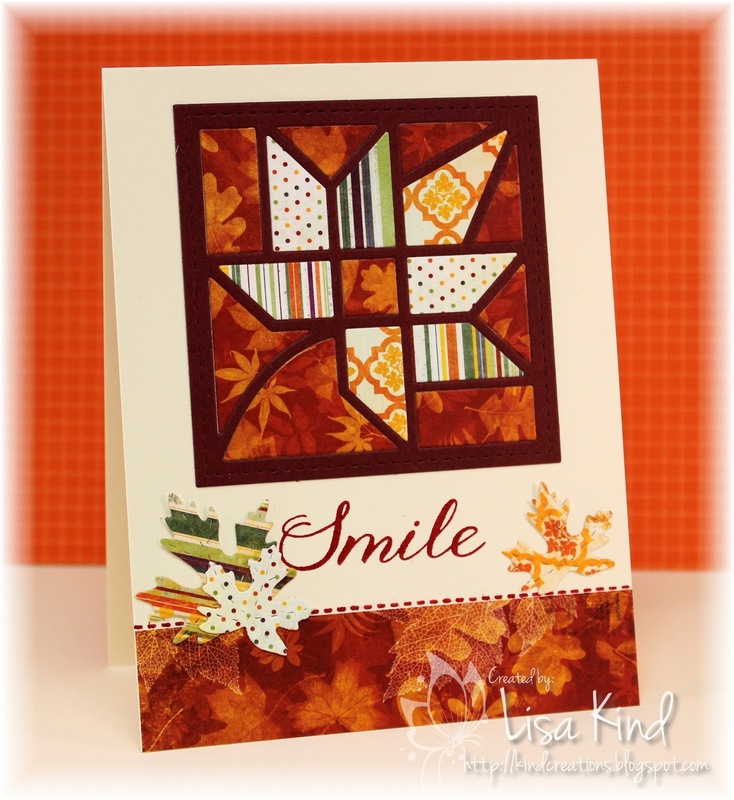 I just love the quilted series the PTI has designed and this tag is really fabulous! 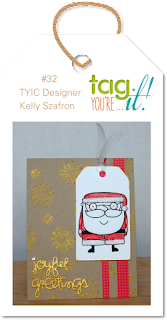 I stamped the pieces inside the snowflake and added some ribbon, twine, and bells to the tag. The sentiment was embossed in white on the banner. I think this stamp set is my favorite of the release. I just love tea cups and teapots. 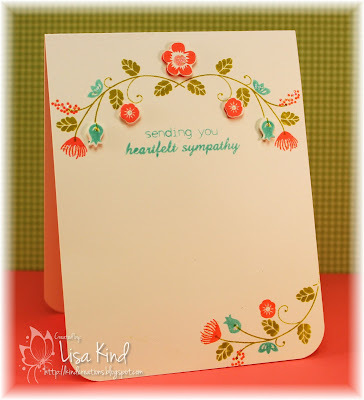 I stamped this one in red on the die cut and added a floral spray from more die cuts. There is some yellow stickles in the center of the poinsettia. The front of the card was impressed with the linen impression plate. 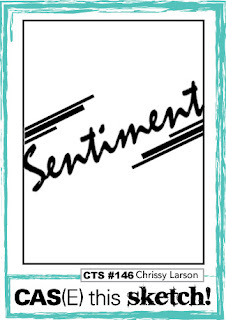 The sentiment from the set was stamped in ﻿black. 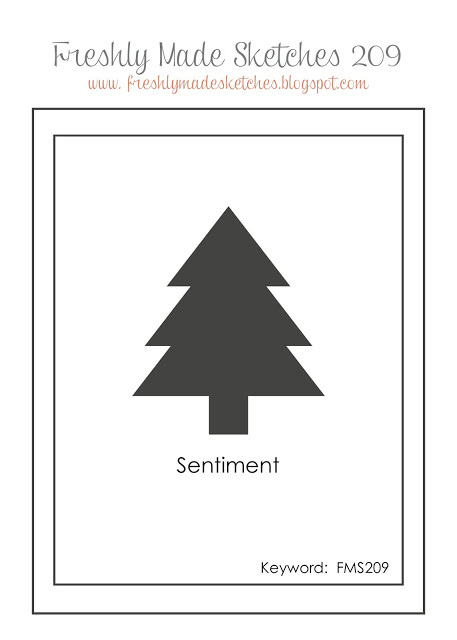 Simple card. That's it from me today! Thanks for stopping by! Happy Saturday! Before I start talking about stamping, I have to tell you that I went to see Sir Paul McCartney in concert on Thursday night! It was a great concert! I'm a diehard Rolling Stones fan, but the Beatles are a close second, and Paul was always my favorite Beatle! Paul didn't put on a show like the Stones do, but it was great nonetheless. I loved all the Beatles and Wings songs he did and Hey Jude was priceless! He performed for 3 hours and did two encores! So much fun! Ok, back to stamping! 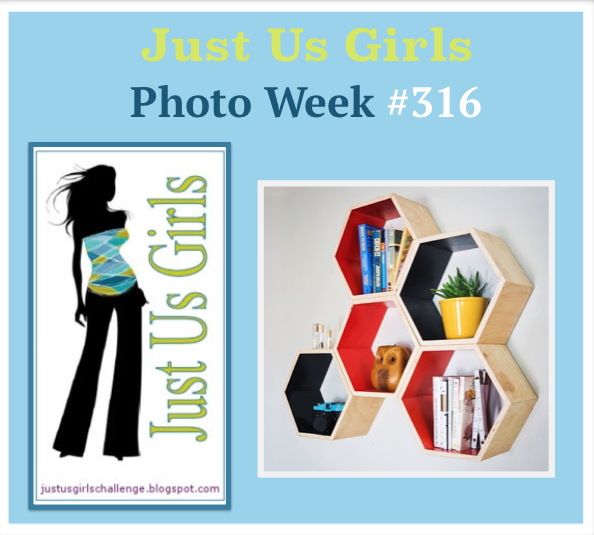 This week over at Just Us Girls it's Photo Week. Ina chose this graphic photo for us to be inspired by. 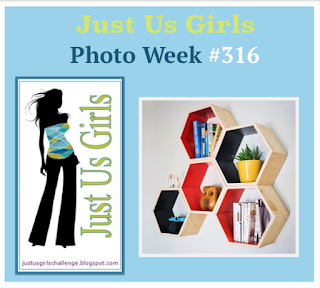 Stop by our JUGs blog to see what the team and our guest has as inspiration for you. Happy Saturday everyone! I don't usually make lots of Halloween cards (even though I have lots of Halloween-themed stamps! 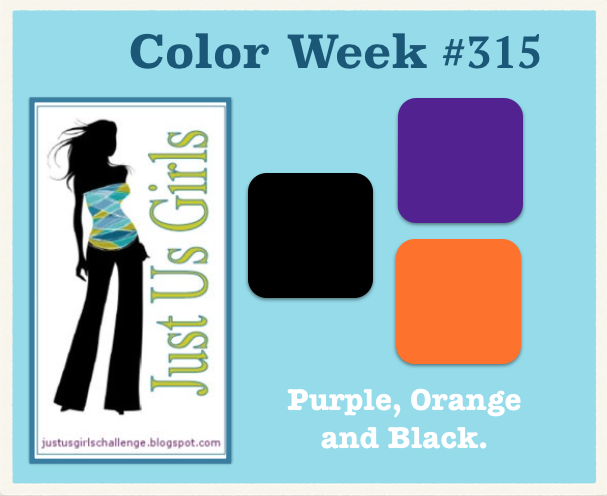 ), but Chris chose some colors for our Just Us Girls color challenge and they screamed Halloween! I've had this Northwoods rubber stamp for a few years and it's never seen ink! I thought it was perfect for this color challenge. 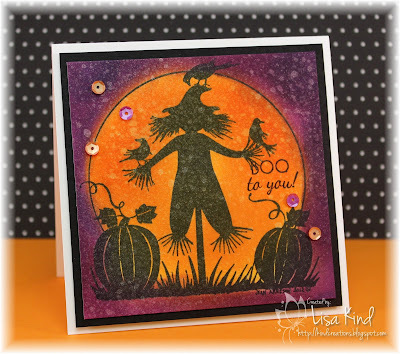 I stamped it in black ink and then sponged the orange ink then the purple around it. I wanted some water droplets, but instead of using water I used Perfect Pearls biscotti mist. I wish I would have used water because it washed out the black ink. But it sure is shimmery! My friend Cheryl bought the mist for me after we used it in a class we took and we really liked the look of it! 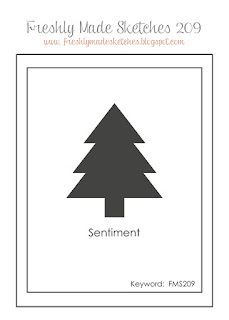 This card is a square 4.25 x 4.25 sized card. 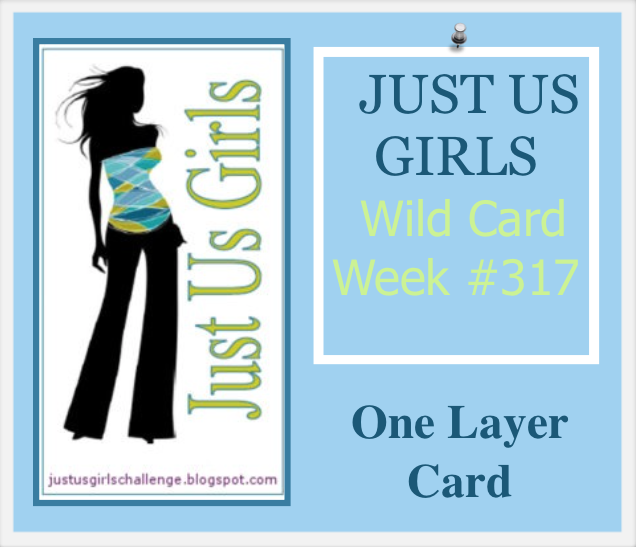 You can see more from the JUGs design team and our guest, Julie Gearinger, on the Just Us Girls blog. 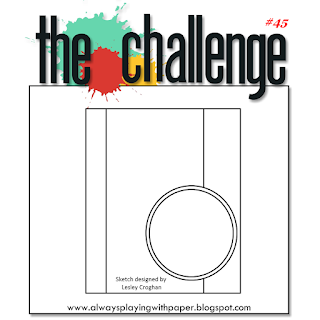 The new challenge over at the Time Out blog is our Home Sweet Home challenge. This is where we provide a photo from a room in a home for you to be inspired by. 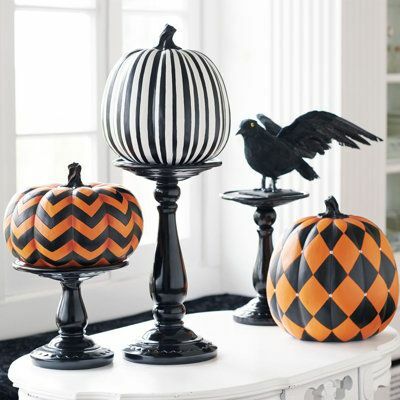 So I was obviously inspired by the pumpkin on the right with the harlequin pattern. I used an emboss resist technique on a piece of pattern paper. The paper is from an old SU Halloween paper pack and was a black and white pattern. 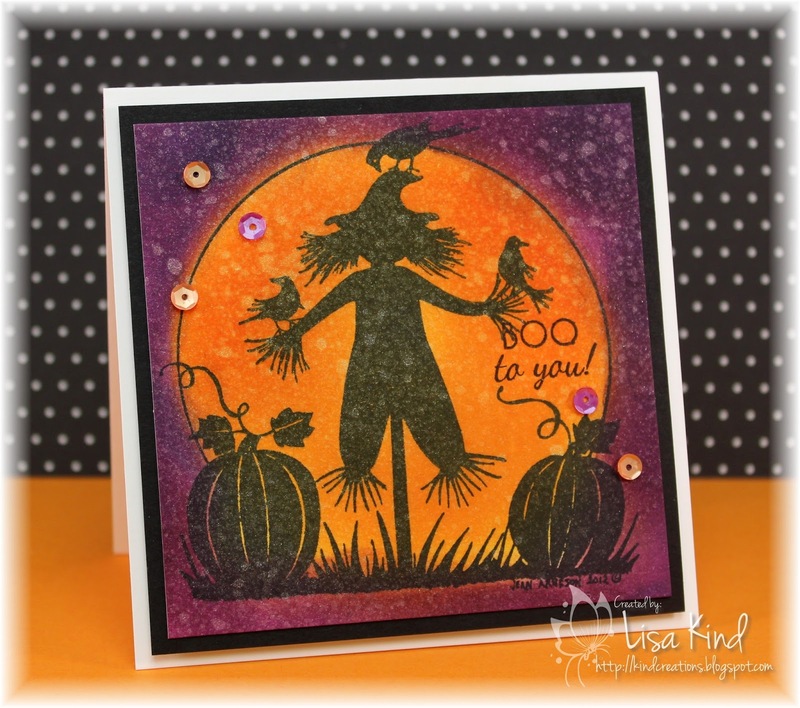 I stamped an old SU harlequin ﻿background stamp in Versamark ink and embossed it with clear embossing powder. Then I sponged over it with spiced marmalade distress ink. I really love the look! 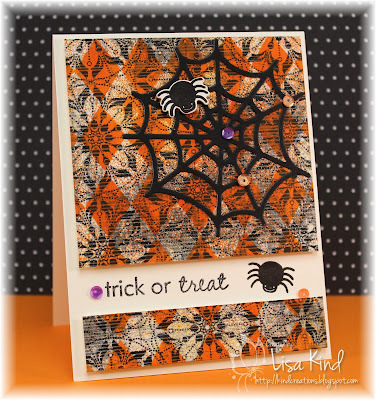 I cut the piece in two parts and stamped the sentiment and spider on the base. The sequins were on my desk from a previous card, so I added them too. 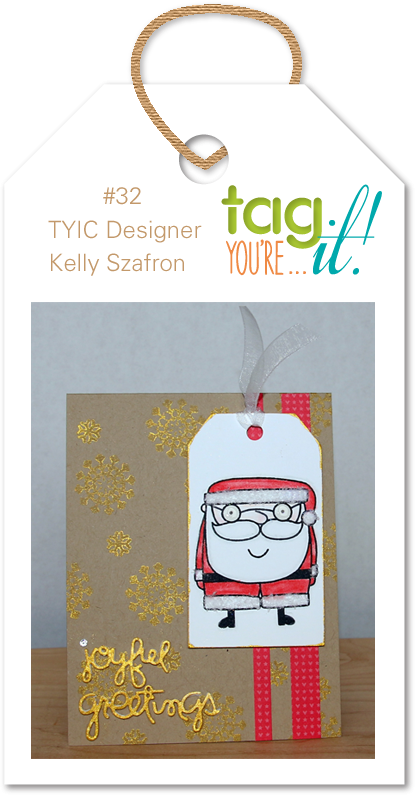 You can see more from the Time Out design team and our guest for this challenge, TaeEun, on the Time Out blog. 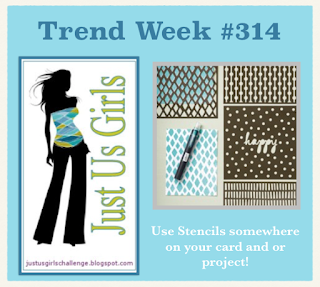 It's Trend Week over at Just Us Girls and Nancy chose stenciling! I love my stencils and use them a lot. They are such fun to use! 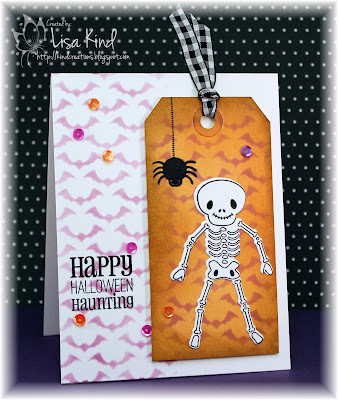 I'm entering this card in the Tag You're It challenge too! You can see more from the JUGs team and our guest on the JUGs blog. I purchased this Harvest Mouse stamp set last week from my LSS. My friend Cheryl and I were there for an amazing technique class taught by Tammy Tutterow. More on those techniques in another post! So one night I stamped and colored three of the five mouse images from the stamp set while I was watching TV. (I got my color inspiration from Jennifer McGuire who colored these in one of her fabulous videos.) Coloring them was half the battle! 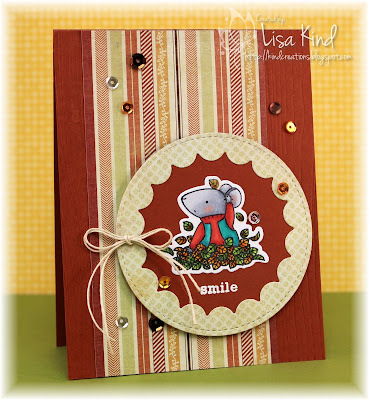 Then I die cut the circles to place him on, added the striped dp to a base that was embossed with a wood impression plate, and added a twine bow and sequins for sparkle. The circle is popped up on fun foam. The layout I used is from The Challenge. 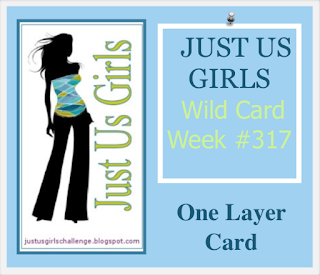 I'm also entering this in the 30 Day Color Challenge. I haven't colored in a really long time. I forgot how fun it is! You can see more from the designers on the Time Out blog. 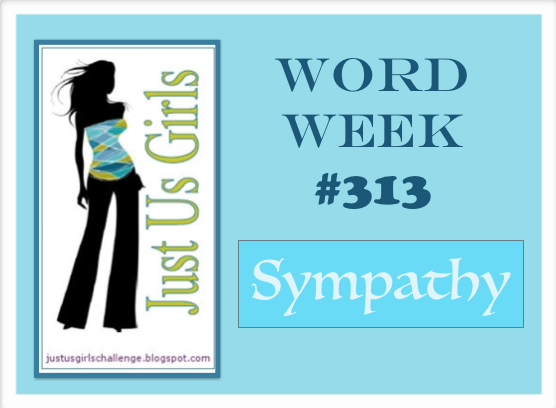 It's Word Week at Just Us Girls and Sue chose "sympathy" as the word. As it turns out, I'm in need of a sympathy card. I never have these on hand, and they are never on my list of cards to make. I like simpler designs for sympathy cards, so I chose this floral vine stamp. I popped up a few of the flowers and added some star dust stickles to them. At first I left the bottom two thirds of the card untouched, but I just couldn't leave it blank! Too much white space for me! 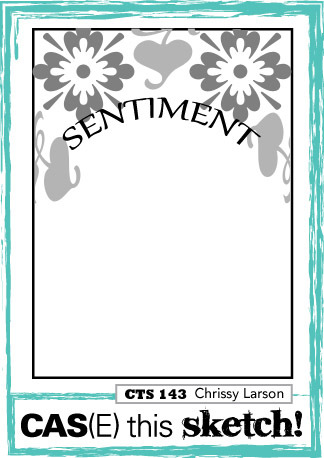 So I stamped part of the vine and flowers on the bottom corner. Much better (IMHO). 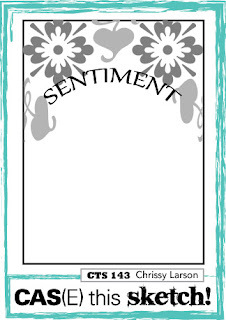 This sketch from CAS(E) this Sketch was perfect for my card. You can see more from the JUGs design team and our guest, Melissa, on the JUGs blog. 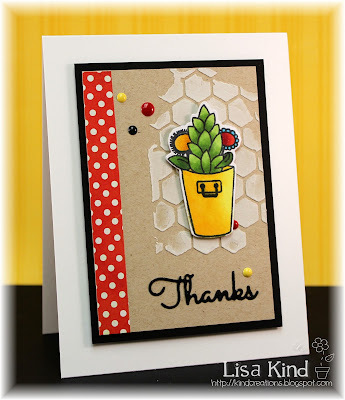 You can see more from the design team and our guest, Glenda, on the Time Out blog.